L196 is located under L2. L277 is located under L23. P89.2 is located under U106. S44 is located under S28/U152. SNPS named Page are so named for their discoverer/developer David C. Page, Whitehead Institute for Biomedical Research. They are also written out such as PAGES00007 or PS7. Y-DNA haplogroup R (M207) is believed to have arisen approximately 27,000 years ago in Asia. The two currently defined subclades are R1 and R2. Haplogroup R1 (M173) is estimated to have arisen during the height of the Last Glacial Maximum (LGM), about 18,500 years ago, most likely in southwestern Asia. The two most common descendant clades of haplogroup R1 are R1a and R1b. R1a (M420) is believed to have arisen on the Eurasian Steppe or the Indus Valley, and today is most frequently observed in eastern Europe and in western and central Asia. Haplogroup R1a1a7 (M458) is found at frequencies approaching or exceeding 30% in Eastern Europe. R1b (M343) is believed to have arisen in southwest Asia and today its sublcades are bound in various distributions across Eurasia and Africa. Paragroup R1b1* and haplogroup R1b1a (V88) are found most frequently in SW Asia and Africa. The African examples are almost entirely within R1b1a and are associated with the spread of Chadic languages. Haplogroup R1b1b (P297) is found throughout Eurasia. Haplogroup R1b1b1 (M73) is observed most frequently in Asia, with low frequency of observation in Europe. Haplogroup R1b1b2 (M269) is observed most frequently in Europe, especially western Europe, but with notable frequency in southwest Asia. R1b1b2 is estimated to have arisen approximately 4,000 to 8,000 years ago in southwest Asia and to have spread into Europe from there. The Atlantic Modal Haplotype, or AMH, is the most common STR haplotype in haplogroup R1b1b2a1a (P310/S129) and most European R1b1b2 belongs to haplogroups R1b1b2a1a1 (U106) or R1b1b2a1a2 (P312/S116). Balaresque et al, A Predominantly Neolithic Origin for European Paternal Lineages. PLoS biology. 8(1):e1000285 2010. Cruciani et al, Human Y Chromosome Haplogroup R-V88: A Paternal Genetic Record of Early Mid Holocene Trans-Saharan Connections and the Spread of Chadic Languages. (abstract) (Epub ahead of print) European Journal of Human Genetics, January 6, 2010a. Cruciani et al, Strong Intra- and Inter-continental Differentiation Revealed by Y chromosome SNPs M269, U106 and U152. Forensic Science International. Genetics,7-10, 2010b. Hinds et al, Whole-genome Patterns of Common DNA Variation in Three Human Populations. Science, 307:1072-1079, 2005. Moore et al, A Y-chromosome Signature of Hegemony in Gaelic Ireland. American Journal of Human Genetics, 78(2):334-338, 2006.
. Myres et al, A Major Y-chromosome Haplogroup R1b Holocene Era Founder Effect in Central and Western Europe. European journal of human genetics : EJHG. (July):1-7, 2010. Repping et al, High Mutation Rates Have Driven Extensive Structural Polymorphism among Human Y Chromosomes. (pdf) National Genetics, 38: 463-467, 2006. Underhill et al, Separating the Post-Glacial Coancestry of European and Asian Y Chromosomes within Haplogroup R1a. (abstract) European Journal of Human Genetics, 1-6, 2009. Richard Stevens, R-P312 and Subclades Project. Added the following SNPs L165, L193, L196, L226, P89.2, V7, V8, V35, V45, V69, V88 and Cruciani et al (2010) on 12 January 2010. Revised Haplogroup description and removed links in Additional Resources that no longer exist or are outdated on 13 January 2010. Moved Ron Scott reference in additional resources to Tree Trunk on 13 January 2010. Added the following SNPs L120, L122 L145, L146, M417, M448, M449, M459, M511, M512, M513, M514, M515, M516, Page07 on 16 January 2010. Added Hinds et al (2005) and Repping (2006) on 16 January 2010. Changed position for L165 to identical with S68 and added L265 on 27 January 2010. Changed M306/S1 from R to R1; added P245 on 29 January 2010. Added S168 on 1 February 2010. Added L4 (no longer private), S167 and S176 on 3 March 2010. Added L150, L151, and L277 on 9 April 2010. Added L260; corrected typo of L222 to L122; changed M335 from private to confirmed on 25 April 2010. Reclassified L277 as private and added L278 on 26 April 2010. Added L257 on 12 May 2010. SNPs M17, M198, M512, M514, and M515 were removed from R1a1a and moved to R1a1a1 on 17 August 2010. SNPs for R1a1a and R1a1a1 were inadvertently reversed and are now in their proper order on 25 August 2010. Added L144, L266, M412, M415, M478, M479, M520, M529, S175, S178 and S186 on 9 September 2010. Added Cruciani et al (2010b), Myers et al (2010) on 9 September 2010. 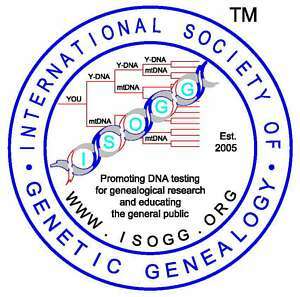 Added R1a International Y-DNA Project on 2 November 2010. Added more information on Notes about SNPs from David C. Page on 4 November 2010. Copyright 2010. International Society of Genetic Genealogy. All Rights Reserved.